Most dogs possess a sixth sense - adventure. They are eager to explore the sights, sounds and smells of new places, so taking them along on a vacation is a great way to satisfy their cravings for fun and excitement. And many of us do just that. According to a Travel Industry Association survey, some 29.1 million people in the United States took along pets when traveling 50 miles or more in the past three years. The survey found that dogs are the most common pet to take - in 78 percent of the journeys, and the automobile is the primary mode of transportation, used 76 percent of the time. THE HUNT OF HER LIFE, is a nonfiction book about Samantha, an unwanted rescue dog who the author adopts at age 2. 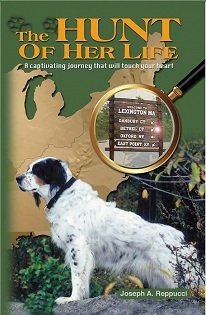 This beautifully designed full-color book, by longtime newspaper journalist and MySetterSam.com publisher Joseph A. Reppucci, contains more than 60 color photos of dogs to help illustrate the compelling and uplifting story of Samantha - a pretty tricolor bird dog who uses her warm personality to win people over and build a new family after being put up for adoption by a hunter because she is gun-shy and afraid to hunt. Learn how she uses her special bonding abilities with people to help her eventually make a transition from the hunting fields to family life. While reading the The Hunt of Her Life, you will travel with Samantha and the author along a trail filled with surprising twists, sudden turns, mystery and even what some call a miracle. And when the journey is finished, you may never look at people and their pets, motherhood - and perhaps even God - in the same way. The Hunt of Her Life is must reading. It will take you on a captivating journey - a trip like no other - that will touch your heart. But before you pack your dog into the car for that lengthy journey, remember that careful planning and preparation are essential to having a fun, safe family vacation with your best pal. Make sure your dog has proper identification. Your pal will be in a place far from home, so a dog license is a must. Also, consider getting a tag which has your name, address and phone number and an identification collar with your contact information. Do this even if your dog has an implanted identification microchip, which could take time to get read. If your dog gets lost, the person who finds him can call your home phone and leave a voice mail message right away so you can contact them. Pack a separate doggy suitcase. The best way to remember to take all of your dog's essentials is to have a separate checklist and bag. Pack enough food for the entire trip, especially if your dog is on a special diet, because the food your dog needs or likes may be unavailable at stores or veterinarians' offices where you are going. The same goes for medications. And take your pal's bowl, brush, toys, bed and favorite blanket to provide a feel of home. Make the vehicle comfortable and safe for the drive. If the drive is hours or days, set up a spot in the back seat with a comfortable blanket for your dog to sleep and make sure your pal is wearing a harness that hooks to a safety belt for protection. If your dog prefers riding while in a kennel, make sure it is strapped down. Make frequent stops to let your pal stretch his legs, see new scenery and sniff new smells. It's all part of the adventure! Carefully plan to ensure pet-friendly lodging is available along the route to your destination. For far-away vacation destinations that will require staying overnight to reach, make reservations in advance for your stop-over lodging. Unlike many years ago, nowadays many major lodging chains - like La Quinta Inns/Suites, Holiday Inn, Motel 6, Red Roof Inn, Best Western, Sheraton-Westin and Choice Hotels - have pet-friendly policies, but many lodging facilities still have no-pets-allowed policies. Purchase a dog travel guide and chart out backup pet-friendly lodges along your travel route. You might get delayed and be unable to reach your planned stop-over point. This happened to me late one night many years ago when a sudden storm forced me to stop overnight in western Connecticut rather than at my planned stop-over point. But I had failed to chart out dog-friendly locations. Rather than us sleeping in the car, I ended up sneaking my 35-pound English Setter into a no-pets-allowed motel by carrying her tucked and hidden in a big blanket through a side door. I slept little than night because I was worried that she might bark and get us tossed out. Vacation at a destination suitable for a dog. Choose a place that has plenty of room for your pal to walk and run. Mountains, parks and lakes are all great vacations destinations for a dog. One of my dogs particularly enjoyed going to the White Mountains of New Hampshire and hiking and swimming in the streams. Beaches are tricky, however, because most have no-pets-allowed restrictions, are crowded and are simply too hot for dogs. A beach community can be OK if a nearby marina or hiking area is available to take the your pal for exercise and adventure. Choose lodging at your vacation destination large enough for your dog to have his own space. Cottages, cabins and campgrounds are good choices. A motel is suitable as long as it is large enough for your pal to have his own space, so choose one with separate sleeping and kitchen areas. A cramped studio motel room with two beds is inadequate, especially if your have a large dog. But even a small dog likes to have some space for himself. Most importantly, make your dog feel comfortable at your vacation destination - like this is a home away from home. Set up take your pal's food and water bowls, toys, bed and favorite blanket. Dogs are creatures of habit, so providing them with familiar surroundings will help them to quickly adjust. Taking a dog along on vacation may be extra work but is absolutely worthwhile. Some of my best vacations were with my dogs. On a couple of occasions, I took one of my English Setters to Clearwater Beach, Florida. She was like a child in a candy store, marveling and pointing at the assortment of large sea birds - pelicans, egrets and heron - that she had never seen before. Each afternoon, I would take her to the marina to watch as the fishing boats returned from sea with their day's catch. As they cleaned and gutted the fish on the docks, hundreds of pelicans flocked around as they waited their turns to get a handout of fish heads and tails. My mesmerized bird dog would watch, point and stalk, sometimes for hours, as the giant birds flew overhead and crowded onto the docks only a few feet from her. For my pal, Mother Nature's Greatest Show on Earth was the ultimate adventure - and I had a front-row seat.